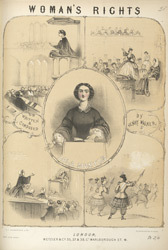 The Music Halls were critical of the women's suffrage movement. In general women's dependency upon men and their loyalty to marriage was unquestioned. This song ridicules women's desire to play a more active role in politics and society, mocking the female soldier who would have to battle against her crinoline before she even reached the enemy. The illustration also includes references to 'Lola Montes', who was an infamous 19th Century dancer and courtesan who had scandalous relationships with personalities such as the King of Bavaria and Franz Lizst. She has been included in this illustration as a way of undermining women's positions of authority in society.